Been working on this for a little while and I have almost finished it. I just need a chape and buckle furniture. Anyone have some good sources for both? Wow, that looks really great Tom! Don't know about chapes, but I know Historic Enterprises has some very good buckles. That looks excellent! Right in my favourite period. Can't help much on the supplies. Could you slit/split and tie for your belt ends and forget the buckle (not sure if that would be authentic)? Either would be period, from what I have been able to find out. I think it may be to late to cut slots as the belt is an even 1" wide. Period pictures of split and tied belts I have seen are much wider. I was combing through Records of the Medieval Sword and I may have a period scabbard tip solution that should be quite simple to make. I hear Historic Enterprises have some nice belt furniture, though I want to find some others to compare for price and styles. I was combing through Records of the Medieval Sword and I may have a period scabbard tip solution that should be quite simple to make..
Hope you dont mind me asking which scabbard chapes are you talking about in records of the medieval sword? 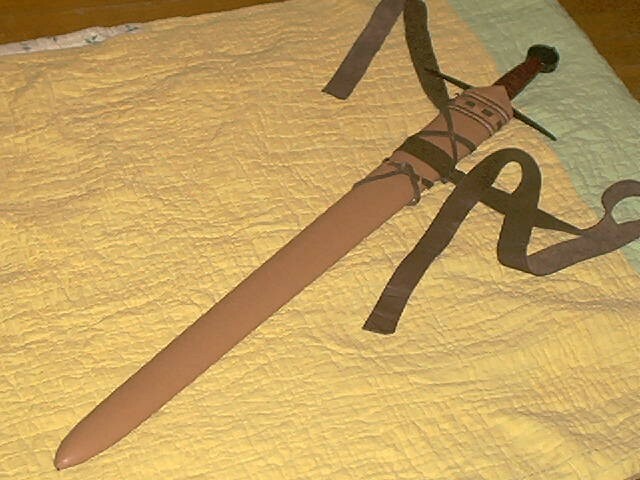 last time i made a scabbard i gave up the time i got to the chape because i couldnt figure out how to make one. They don't carry chapes, though. nice job...are we going to see a new scabbard maker become available? Already making them, sort of on the side. I will have to find a retailer that will post them on his site to get more exposer though. 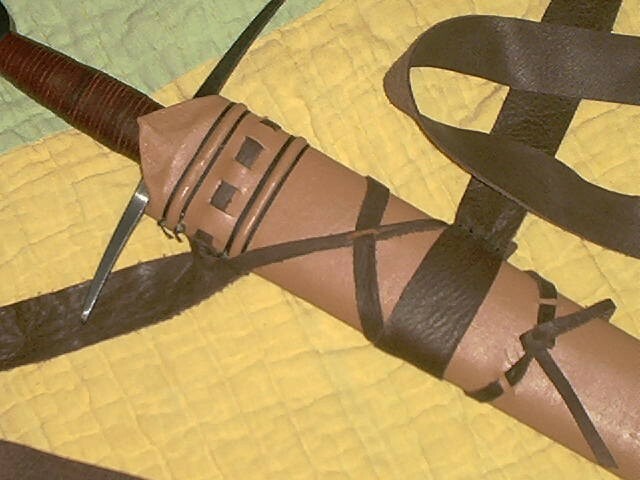 I have some examples posted in Photobucket of wood scabbards, This is the first I have covered in leather. The plain wood ones look very good as it is and they are quite affordable. PM me and I can send you some pics and prices. If you look at the Type XII's and find the sword of Sancho the IV I believe, you will see a scabbard tip that is a simple strip of metal curved over the end with dog ears that attach to the flats of the scabbard. A couple of pages farther along and there are 2 drawings of the same thing from contemperary depictions of scabbards for type XII's. It seems the easiest and most authenic choice. Have to find some thin copper or silver sheet and shape to fit. Well quess what I just found in a drawer. An old thin silver plated candle dish thing the wife found at a garage sale. Should be enough to make the tip piece and a little left over. Now I need some tin snips!